File Name: Jack S. Morelli of Eugene, Oregon. Notes: Eugene is in the west central part of the state, about 65 miles south of Salem. 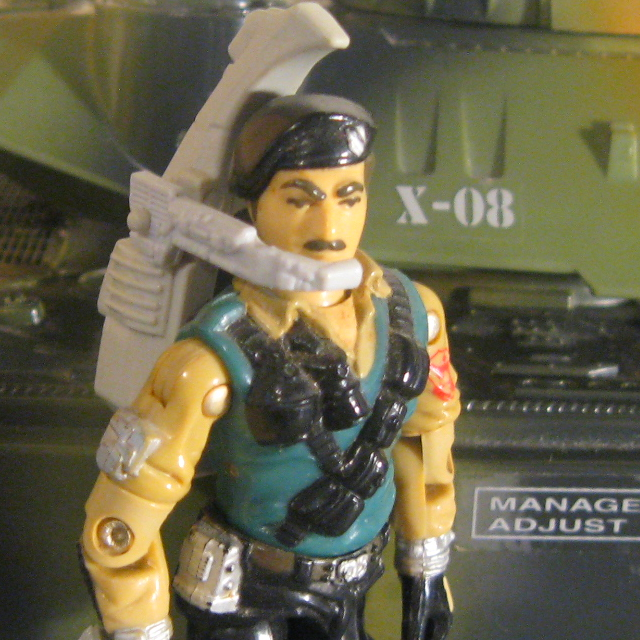 Sunbow's Dial-Tone wore his first 1986 outfit, with a plain black beret, a brighter yellow shirt, and green pants with black boots and kneepads. The Spy Who Rooked Me 183 seconds 12 lines on Armadillo to deliver nerve gas; captured; returning with H.A.V.O.C. G.I. Joe: The Movie, Part 4 14 seconds 1 line monitoring communications at Joe HQ; hiding B.E.T. Accessories: light grey HK53 compact assault rifle with silencer and long grip (new), light grey tall curved communications backpack with peg for mic (new), light grey large curved mic (new). Dial-Tone built his own crystal set when he was ten. By fourteen he was part of a CB net, and had his own ham station by the time he was sixteen. Dial-Tone made all his own equipment, buying parts with quarters earned bagging groceries. He saw the army as a means to furthering his education in his chosen field and quickly found that instead of a stepping stone, it was a goal in itself. Manning a radio in the field wasn't just passing time - it was a job with a purpose. "One of the scariest things that can happen to you out in the field is to lose contact with your base. That means you are ALONE. No artillery support, no air strikes, no medvac, no extraction, no NOTHING! The cavalry ain't comin' until the man with the radio tells 'em to." Toy Notes: Featured in 1986's Battle Stations commercial, manning the L.A.W. Item #6471. Accessories: light grey rifle (86 Dial-Tone's), light grey backpack (86 Dial-Tone's), light grey mic (86 Dial-Tone's). Toy Notes: Boxed in a Toys 'R Us-exclusive set with Claymore, Leatherneck, Mainframe, Wet-Suit, and an audio cassette. Item #6691. 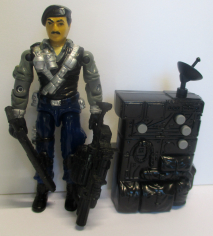 Accessories: black pistol (87 Blocker's), black rifle (86 Dial-Tone's), black grenade launcher and chamber (88 Hardball's), black flamethrower (88 Charbroil's), black sonic backpack with radar dish on top (new). DIAL-TONE's been fixing and building communication systems since he was knee high to a Thyratron. Ten years experience and advanced forces training has also made him an expert in the field of laser technology. To Dial-Tone, bouncing a message off a satellite halfway around the globe, and firing a high-intensity laser burst at a moving target, are essentially the same thing. So when he heard the high command was looking for seasoned troopers with specialized skills, Dial-Tone said, 'Hold my calls!' Dial-Tone is also the unofficial electronics repairman for the team. "Out in the field, Dial-Tone used to be the guy caught in the fire fight, huddled in the mud somewhere, screaming at headquarters for reinforcement. Now, he's the reinforcement, and the only message this guy sends is, 'Duck!'" Assigned Armaments: Multi-Burst Laser Pistol, XML-3000 Laser Rifle, 40mm XML-2000 Grenade Launcher, and 5.56mm Submachine Gun. Variations: Some backpacks had a raised edge around the buttons. Accessories: neon yellow pistol (87 Psyche-Out's), neon yellow rifle (86 Dial-Tone's), neon yellow machine gun (92 Gung-Ho's), silver gun-shaped spring missile launcher with long grip and neon yellow trigger (new), two neon yellow spring missiles (93 Keel-Haul's), neon yellow knife (88 Hit & Run's), blue high-tech helmet with attached mic and neon yellow visor (new), neon yellow figure stand (common). DIAL-TONE is an electronic communications expert with a thirst for combat. He can tune in on enemy transmitter frequencies, locate their coordinates, then attack with pinpoint accuracy. He's like a walking Tomahawk missile, he just zeros in on enemy locations then blasts into battle with unstoppable firepower. He is also very dedicated to his G.I. Joe team members. He stays in constant radio contact with them to make sure no one gets lost behind enemy lines. Whether they're calling for assistance or asking for an airstrike, Dial-Tone delivers loud and clear. Motto: "My top 40 hit list doesn't consist of the most popular songs, it consists of the most wanted Cobras!" Variations: First sold on 1993-style packaging with a normal-sized filecard, then on 1994-style packaging with a baseball card-sized filecard with abbreviated text. Some copies have a blue shirt under the vest instead of a green one. Accessories: black submachine gun and stock (91 Dusty's), black backpack (91 Dusty's), black walkie-talkie (84 Firefly's), black figure stand (common). Dial Tone served as a telecommunications expert for years before volunteering for duty with the G.I. Joe team. He can tune in on enemy transmitter frequencies, locate their coordinates, then attack with pinpoint accuracy. An expert electronics repairman, he also holds the record for setting up a mobile satellite transmitter under battlefield conditions in less than three minutes. Dial Tone's main responsibility is to stay in touch with H.Q. and get the team to the correct extraction site. In environments where there is no radio contact, no reinforcements or evacuation, you're just a sitting duck. That's not a problem for Dial Tone, since he always delivers the message loud and clear. Here's a guy that has to man the radio and be part of a firefight, in a place where you can't see ten feet in front of you. It takes a soldier with keen instinct and ability. Lucky for us - he has both. Variations: Some copies have brown grenades on the chest instead of silver ones, and most do not have silver details on the belt. Toy Notes: Carded in a two-pack with Gen. Tomahawk. Item #57730. 8-Pack Accessories: silver rifle (86 Leatherneck's), silver RPG (02 Dusty's, with Sound Attack tab), silver bandolier (02 Dusty's), black backpack (91 Big Ben's). A.W.E. Striker Accessories: black submachine gun (84 Firefly's, with Sound Attack tab). DIAL TONE served as a telecommunications expert for years before volunteering for duty with the G.I. JOE team. He can tune in on enemy transmitter frequencies and locate their coordinates, then attack with pinpoint accuracy. An expert electronics repairman, he also holds the record for setting up a mobile satellite transmitter under battlefield conditions in less than three minutes. His main responsibility is to stay in touch with headquarters and get the team to the correct extraction site. Nothing stops him from doing his job - he even finds ways to get his team out even when there is no radio contact. "I make sure my message gets out loud and clear." Toy Notes: Boxed in a B.J. 's-exclusive set with Roadblock, Snake Eyes, Wet-Suit, Fast Blast Viper, Firefly, Storm Shadow, and Undertow. Item #53227. Reissues: Boxed in May 2003 with the Toys 'R Us-exclusive A.W.E. Striker. Accessories: black rifle (91 Red Star's), black backpack (92 Gung-Ho's). DIAL TONE served as a telecommunications expert for years before volunteering for duty with the G.I. JOE team. He can tune in on enemy transmitter frequencies and locate their coordinates, then attack with pinpoint accuracy. And expert electronics repairman, he also holds the record for setting up a mobile satellite transmitter under battlefield conditions in less than three minutes. His main responsibility is to stay in touch with headquarters and get the team to the correct extraction site. Nothing stops DIAL TONE from doing his job - he even finds ways to get his team out even when there is no radio contact. Variations: Early releases of the figure had pale skin rather than the more common pink. Toy Notes: Carded in a Toys 'R Us-exclusive set with Sgt. Stalker, Big Brawler, Wreckage, and Agent Jinx. Item #53263.